I don’t know about you, but as a woman planted firmly in middle age, I have trouble sleeping through the night. Actually, I should (cautiously) say that I used to. 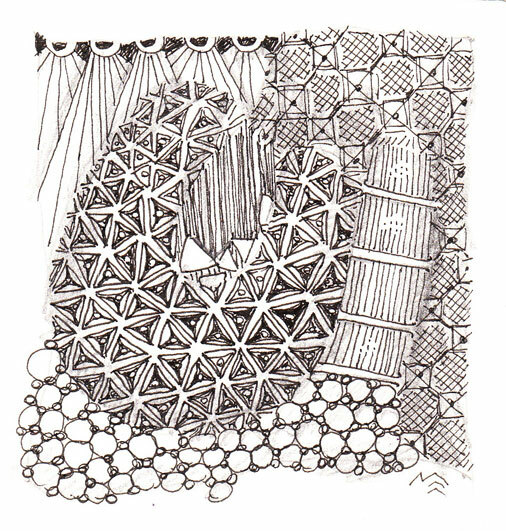 One of the benefits I’ve found from tangling (entering a state of mindfulness by drawing a Zentangle®) on a daily basis for the last couple of weeks is that I have slept really, really well. July 29: Mi2, Tripoli, Zander, Keeko, Fescu, and a tangellation of Shattuck. July 29: Tripoli, Zander, Footlights, Tipple, and a grid-based pattern. 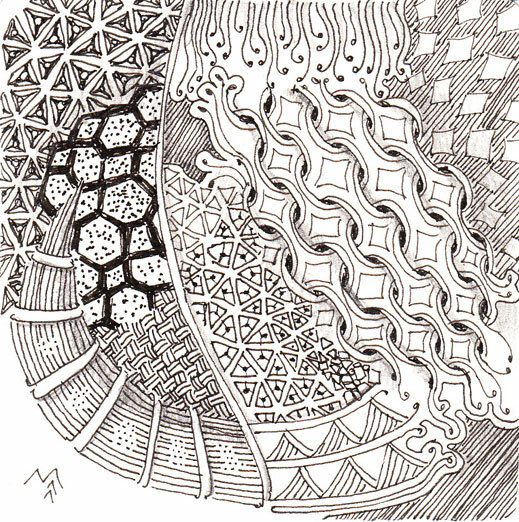 Technically not on a Zentangle tile, but drawn in my Moleskine sketchbook; the following tangle would be considered ZIA, or Zentangle Inspired Art. July 30: Mi2, Betweed, Squished Eggs, Meeko, Florez, Paradox, Featherfall, Keeko Fescu and Shattuck. 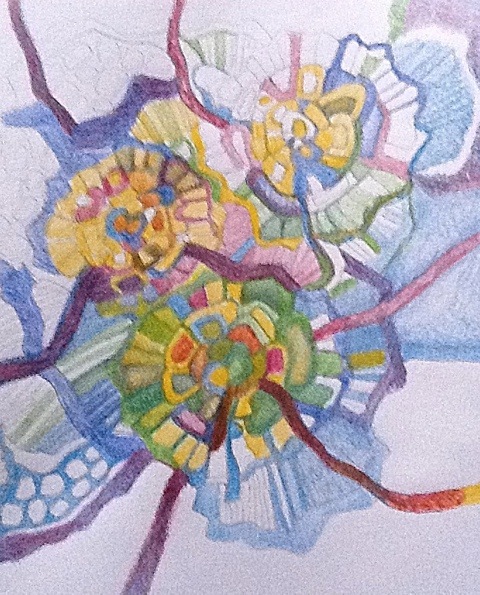 Here is a drawing I started on paper, using colored pencil. I’m going to use Sketchbook Pro on my iPad to create better color progressions. The coolest thing is that I’ll still have my original in my journal. I can leave it, or use what I discover digitally to add to it. Bear with me… While I’m no stranger to digital artwork, I’m new to the iPad and to Sketchbook Pro. The latest is a progression of shapes and colors which impart the sense of summer turning into fall… and that wasn’t my goal. 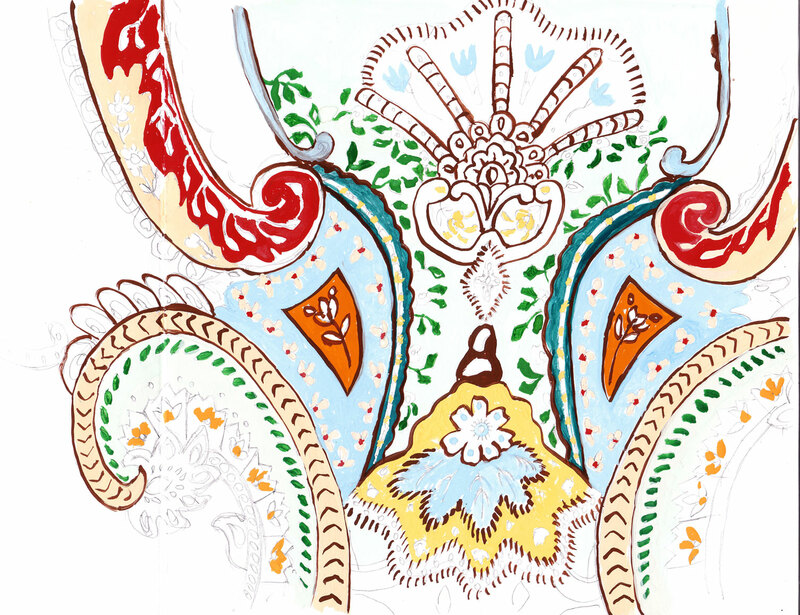 I started with repetitive shapes drawn in pencil, because of my latest fascination with repeating patterns and motifs. The idea in my head was very two-dimensional, and this has taken on a sense of depth. That’s okay, though. My journal often takes my head for a walk. It’s that over-confident artist-blindness that happens to me sometimes. Not all the time, but significantly enough for me to know that I have to watch out for it. During artist-blindness, I completely disregarded years of painting work and associated learning what I’m all about as a result. Bonus: all of the past work and learning shows itself in my work now. This includes all of the hair-pulling about letting go of control and letting things happen in the moment, or by accident. All that hair-pulling and accidental happening resulted in some good, fresh work that is very “me.” I am an immediate, in-the-now person who remembers the joy of watching a finger painting happen under my hands 50 years ago, and who continually strives to get that essence into my work today. So why would I think that a new direction, which involves painting the same thing over and over the same way with very small brushes, would somehow be the latest grand statement that I could make as an artist? I think the answer is that we all like to explore, and go out on tangents. That’s one of the reasons I keep a visual journal. Once in a while, the tangent doesn’t end on the journal page. It screams and stomps around until it can have its own canvas. The result? 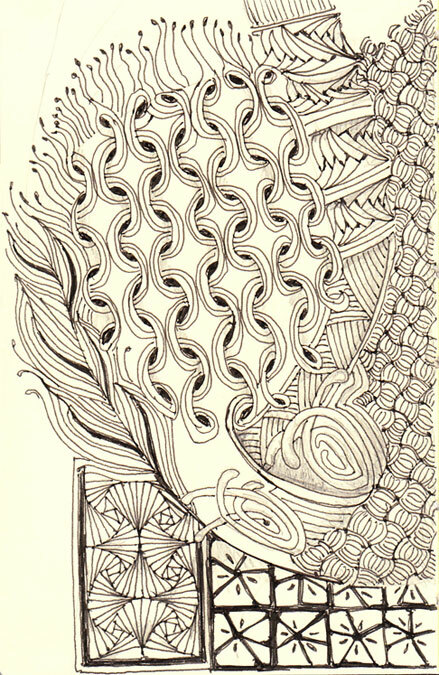 Well, in this case it was a small canvas with interwoven shapes that looked a little bit like rows of onions. Very flat onions, in grays, muted yellows, and greens. It’s not that tangents are a bad thing. They’re especially good in a journal, where you can use them to inform your person-ness, or artist-ness. On some rare occasions, tangents help turn corners and start new things that are really great. Today, my tangent got out of the sketch diary, and just now (about an hour ago) got painted over on the canvas. Maybe it was the two cups of French roast coffee I had Monday morning as I started working in my journal? Hmmm… I didn’t even finish colorizing the page before I leaped up with a painting in my head (first neglected warning sign… the preconceived painting). Here’s the journal page, in its current state. I’ll revisit it to let it be a symbol of the lesson learned, but probably not to paint in any more color areas. I could create a list of all the ways the little editorial voice in my head tells me not to work… there’s not time, you’ve got laundry to do, my sketchbook is just too small (or large), I think I’ll just catch up on emails first, there’s nothing interesting to draw… and if I listen to it, I stay stuck and my pages remain untouched and blank. It’s a sad state to be in, and quite common. There are countless books and articles which address the subject. The answer most all of them give can be boiled down into one word: activity. Draw, paint, write… go! The more you do it, the more the editor fades into the background. Pages fill. Ideas start to flow. Life is good. Feeling stuck? Here is a list. Pick one, crack open your sketch diary, and get to work. It’s the easiest way to get un-stuck. 1. Draw your wallet or purse. 2. Draw concentric forms like Witold Riedel. 3. Cut and tear up pages from a phone book and/or newspaper and make a collage with the interesting pieces. 4. Lightly draw a checkerboard pattern on your page. Fill each square with hatch marks, dots, scribbles, color, or interesting lines. 5. Draw the inside of your junk drawer before you organize it. 6. Make a self portrait. 7. Stick your cooking utensils (spoons, spatulas, ladles, whisks, etc.) in a big canister or jar and draw or paint them. 8. An idea from a class I took from Wendell Arneson: think of a season, or a time of day that resonates with you. Go through old magazines and tear out pictures with colors that represent that season or time. Then make a collage with those colors. 9. Draw a page full of very small things (no bigger than an inch). 10. Create a still life from the goody bag you get at the dentist’s office. Then draw or paint the still life. Then go brush your teeth (you’ll be thinking about it the whole time you’re drawing). 11. Draw or paint a garden tool at an interesting angle on the page. 12. Draw a power strip with cords plugged into it. 13. Make a viewfinder: cut a small rectangle or square from the center of an index card or a piece of stiff paper. Draw what you see through the viewfinder. 14. At a restaurant, draw the stuff on your table before your food arrives. 15. Make really fast gesture drawings of people in a crowd or at the beach. 16. An idea from a visual journaling class with Jane Fasse: pop a bowl of popcorn. Draw interesting pieces of the popcorn, from different angles, or larger or smaller on your page. Then eat the popcorn! 17. 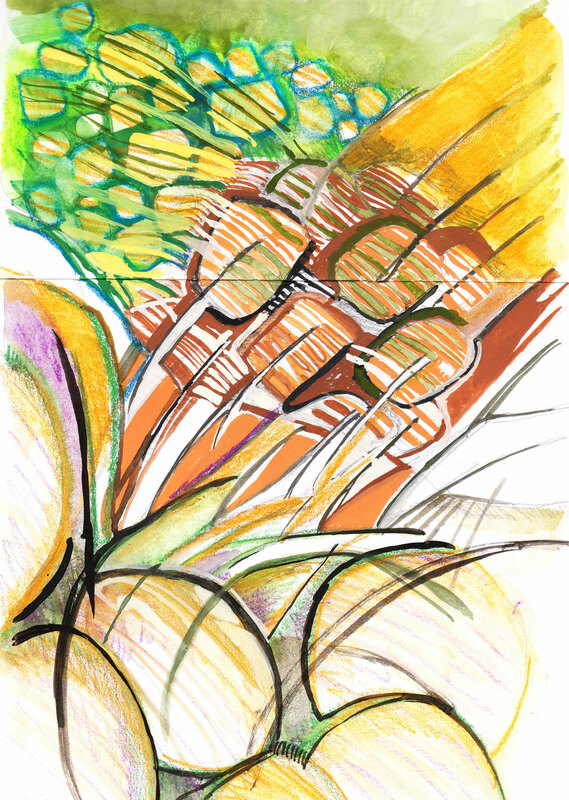 Draw or paint to music… move with the music and make marks and lines all over your page. 18. Make a color record: select a favorite object, or book cover, or greeting card, or photo, or package, or advertisement, and record (with paint or colored pencils or chalk or pastels) the colors used to create the thing (don’t draw the actual thing, just the colors). Use that color palette to create a picture of your own. 19. Find an interesting pattern, like floor tiles or on fabric, and draw the pattern. 20. Draw your jacket, or a towel, hanging on a hook. 21. Make an intricate drawing of a leaf. 22. Draw or paint the ingredients of your favorite recipe. 23. Paint an emotion using only color and line. 24. Make a memory map of a place from your childhood: the rooms of your house or apartment, the neighborhood where you lived, or your route to school. 25. On a separate, large piece of paper, make big lines and shapes with ink. After it’s dry, cut it into interesting pieces. Glue some onto your journal page in a new arrangement.